Dandy Walker Homepage - Who is Dr Ali Murat YILMAZ? 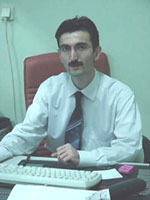 Who is Dr Ali Murat YILMAZ? I was born in Malatya, one of the eastern provinces of TURKEY in 1970. I graduated from Istanbul University Cerrahpasa Medical Faculty in 1993 and joined the Internal Medicine Department of the same University. In 1999 I was an internal medicine specialist. Currently, I’m the manager of a little but important "medical center" named "Belde TIP Merkezi" in Istanbul-Turkey. I’m married and have a kid with Dandy-Walker Syndrome. I’ve noticed that there were a lot of web-pages on that disease in English but none in Turkish. Therefor, I created a Turkish website and then translated it into English. I’ll try to answer any of your questions on this topic and help you. You can write anything you want; questions, feelings, opinions, comments..etc. to me.